Austen contains a wide range of flexible templates for your pages including:Homepage, Blog Page, 1 Column Portfolio, 2 Column Portfolio, 3 Column Portfolio, 4 Column Portfolio, 2 Column Gallery, 3 Column Gallery, 4 Column Gallery, Contact Page. 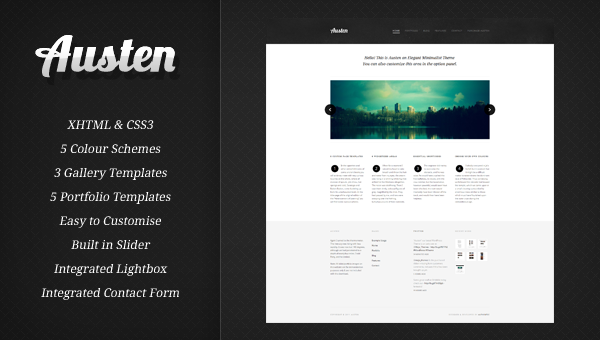 Austen Also Includes: CSS3 Buttons, Styled: Quotes & Lists, Drop Caps. We have personally tested Austen on the following browsers: Chrome, Firefox, Safari, Internet Explorer 8, 9 and Iphone OS4. We have also included an extensive documentation file to help you on your journey! If you need support, please use the comments section below for any assistance you need.